A good garage door opener should be able to function problem-free for years, but it will require some general maintenance from time to time to keep it in a good working condition. If you do find yourself facing some type of issue, our professional technicians will get to the root of the problem quickly and have your opener back in an optimal shape in no time. 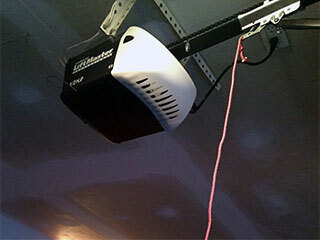 Garage door openers use one of three different kinds of drive-systems in order to work. One of the most common types is the chain drive. Models who use this type are affordable and strong. On the downside, they can be quite noisy, and will probably require more maintenance than other types. The belt drive is an excellent alternative if you want something that is quiet and durable, however it will be a little more expensive. Screw drive openers are fast and require only a minimal amount of maintenance, as they are made up of very few moving parts. However, they aren't exactly quiet, and also tend to be affected by drastic temperature shifts. Every manufacturer has specific features that make their products unique, so personal preference will play a major role when you purchase your new opener. If you're looking for something technologically innovative, brands like Genie and LiftMaster are popular due to their reliability and proprietary application of rolling code technology, which changes the opener's access codes every time you use your remote to open the door. Obviously, this can vastly improve the security of your home, so it's worth considering. We also work with major manufacturers like Amarr and Chamberlain, so rest assured that we can help you find a model that's perfect for your specific needs. Once you made your choice, we'll proceed with the opener installation and make sure that your new unit is functioning perfectly. To get the most out of your garage door opener, you need to make sure that it is serviced on a regular basis. Our qualified technicians can carry out checks to ensure that the all of its parts, including the rail, trolley and the safety sensors are working correctly. If we discover a problem, we'll take care of it right then and there. Our team at Garage Door Repair Suwanee provides the best opener services around, and we're always happy to help. If you need some help with this complex electro-mechanical device, don't hesitate to reach out to us.